The Lagos State Magistrate Court, Igbosere, has fixed November 16 for the trial of two men who were docked before it over alleged conduct to breach public peace. The Defendants, Lukman Kadiri and Anthony Folarin were docked before Magistrate Y. O. Aro-Lambo over the alleged offences by the police, other offences preferred against them include conspiracy, false information, threat to life, illegal conversion and fraud. The offences against Kadiri and Folarin according to the police are contrary to and punishable under sections 94, 95(1)(b)(c), 168(1), 412, 96(b), 56(1)(a) and 314(a)(b) and 314(3). However, the Defendants pleaded not guilty to the seven count-charges preferred against them. The police, in a charge marked F/70/2018, alleged that the Defendants, on April 13, 2018, at Abdulmalik Chambers, No. 13, Calcutta Crescent, Apapa, Lagos State, and at the State Criminal Intelligence and Investigation Department (SCIID), Panti-Yaba, conspired and accused the duo of Mrs. Precious Ikedia and Mr. Sanni Saibu Arewa, of forgery, illegal conversion and threat to life. Police alleged that the false information and fictitious made against Mrs. Ikedia and Mr. Arewa, by the two developers at the SCIID, Panti-Lagos, led to the arrest and arraignment of Ikedia and Arewa on charges bordering on forgery, illegal conversion and threat to life. 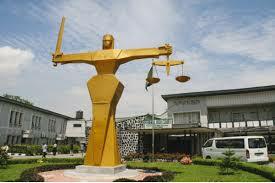 The two defendants were also accused of accused of threatening the life of Mrs. Ikedia and Arewa. They were also alleged to have, on February 7, 2013, fraudulently received the sum of N320, 000. from one Mrs. Joy Smart, under false pretence of subletting a room and parlour self-contained to her. The Defendants had been granted bail by the court, the Magistrate admitted them to bail in the sum of N200, 000, with two sureties each in the like sum. Will Timi Alaibe get the baton now?